2:00pm Roam around Tsim Sha Tsui. Located along the waterfront are attractions like the Hong Kong Cultural Centre, Hong Kong Space Museum, Hong Kong Museum of Art, and the Avenue of Stars. Also check out the Clock Tower, 1881 Heritage and The Peninsula Hotel. 7:30pm Reach for A Symphony of Lights, the world’s largest permanent light-and-sound show, held nightly at 8pm. 8:30pm Explore Harbor City, Hong Kong’s largest shopping mall with hundreds of local and international stores, most open until 9pm. Head to Nathan Road’s famous Golden Mile that bustles with shoppers day and night. It’s renowned for its colorful neon-lit shops, restaurants and nightspots. Most shops stay open until 10pm. Take in the factory outlets along Granville Road, a must for bargain shoppers. 10:30pm Roam about in Temple Street Night Market. Charge camera. 8:00am Take bus 6, 6A, 6X, 66 or 260 from Exchange Square bus terminus (MTR Hong Kong Exit D) to Repulse Bay, the most beautiful beach of Hong Kong. 1:00pm Take Bus 6X or 66 from Stanley Plaza. Alight at Cheung Kong Center in Central. Walk to the Lower Peak Tram Terminus on Garden Road to visit the peak in the tram. We shall decide about visiting Madame Tussauds at that time if time permits. 7:00pm Walk from the Lower Peak Tram Terminus to Queen’s Road Central, turn left at D’Aguilar Street and walk up to Lan Kwai Fong. Enjoy nightlife, Clubs and parties. 9:00pm Walk along Queen’s Road Central towards The Center and then take the Central–Mid-Levels Escalator to SoHo. This place has best nightlife in HK. 4:00pm Take taxi to Shum Wan Shuttle Ferry Pier. Walk to dock for free boat ride to floating restaurant. Its 2.5 Km. We can walk also. It’s a floating restaurant. Looks like an awesome palace. 8:00am — Depart on a TurboJet. 9:00am — Arrival at Macau (Ferry Terminal). Get free tourist Macau maps at the Tourist Information Center. Walk from the ferry terminal to Fisherman’s Wharf. 9:30am — Fisherman’s Wharf, stroll around, take pictures. 10:30am — From Fisherman’s Wharf, walk back to Ferry Terminal then ride a free shuttle bus going to Grand Lisboa, Hotel Liboa, or Grand Emperor Hotel. Start hopping! 11:30am — Lunch at Senado Square. 15 to 20 minute walk from gambling hotels. Ask directions to English-speaking policemen. 1:00pm — Stroll around Senado Square, walk and walk until you reach San Ma Lo for souvenirs, then Ruins St. Paul’s Cathedral, Monte Fort, Macau Museum, Na Tcha Temple (left side if facing Ruins) then go down and walk to your right, Camoes Garden, St. Anthony Church). They are near to each other. 2:00pm — From the Camoes Garden, ride bus #17, 4th stop as you are going to Guia Hill. Then ride a cable car for MOP$3.80 round trip going to Guia Fortress and it’s Lighthouse. 3:00pm — Ride bus #18 going to Macau tower. 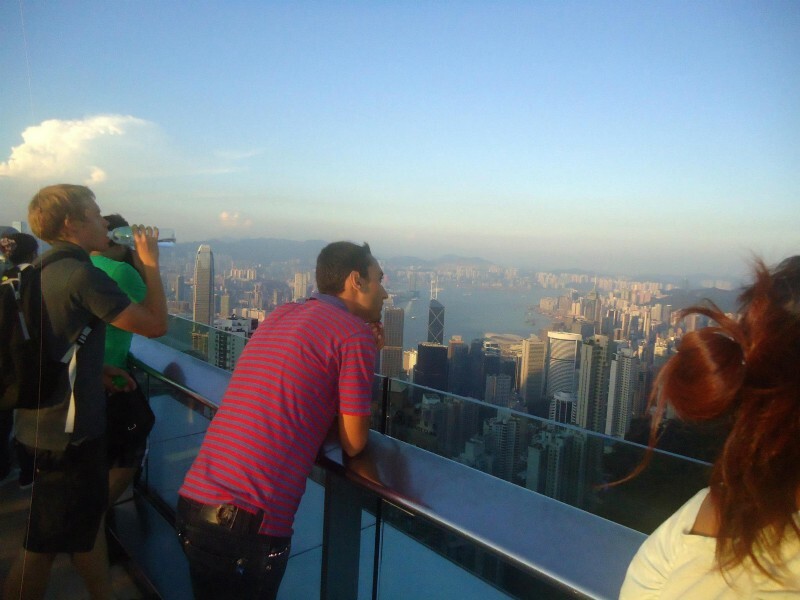 Then explore Macau Tower, if you wish to go inside, there’s an entrance fee of MOP$80. 5:00pm — Ride bus #21A from A-ma temple to Venetian Hotel. Spend at least 2 hours exploring Venetian Hotel. 8:00am Take MTR Wan Chai Station Exit A5. Follow the covered walkway to Golden Bauhinia Square, Wan Chai. It’s historic and architecture place and on our way to airport. The HK Convention and Exhibition Centre, an impressive architectural landmark, is the historic site of the return of Hong Kong to Chinese sovereignty on 1 July 1997.